ILLUMINATING - Create an exhilarating, inspiring and intimate atmosphere in nearly any location. Allow your creativity and imagination to envision these high quality Edison bulbs in your favorite spaces. Use these Edison bulbs to create a timeless retro vintage look or illuminate your clean modern aesthetic. These lights work well in in many spaces inside and out. DESIGN - 40 Watt. Size: 45mm X 110mm (1.8 X 4.4 inches) Fits E26 /E27 sockets. (Standard USA sockets). Manufactured to today's electrical standards but these bulbs still preserve the look, feel and style of early 1900's light bulbs. These antique vintage style bulbs adds a warm glow to any vintage, contemporary or steampunk decor. QUALITY - Crafted with the highest quality material by skilled craftsmen. Features hand-woven tungsten filament, 100% brass metal base, crystal clear glass bulb / globe. Inspired by Thomas Edison's original design and adapted to today's quality standards. VERSATILE - Use these attractive bulbs to bring any room to life! We've seen our Austin Light Co. bulbs used in: bars, restaurants, cafes, stores, bistros, and some outdoor applications. You've probably already enjoyed an Austin Light Co. bulb in one of our many commercial customers around the US. VALUE - All Austin Light Co. Edison Bulbs are sold as a SET OF 6 BULBS. Compare the value and purchase with confidence that you are getting the highest quality and best value Edison Bulbs. All Austin Light Co. Edison Bulbs are securely packed with padding in our high quality ALC branded boxes. Looking for the best quality and value Edison Bulbs? Then Look No Further! 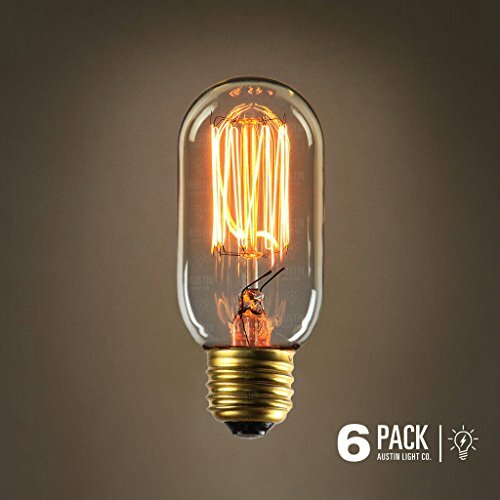 The Austin Light Co. Edison light bulb - 6 Pack offer unmated quality and value. What Makes the AUSTIN LIGHT CO Edison Light Bulbs Different? ✓ VALUE: All Austin Light Co. Edison Bulbs are sold as a SET OF 6 BULBS. Compare the value and purchase with confidence that you are getting the highest quality and best value Edison Bulbs. All Austin Light Co. Edison Bulbs are securely packed with padding in our high quality ALC branded boxes. ✓ QUALITY: Crafted with the highest quality material by skilled craftsmen. Features hand-woven tungsten filament, 100% brass metal base, crystal clear glass bulb / globe. Fits E26 /E27 sockets. (standard USA sockets). ✓ VERSATILE: Use these attractive bulbs to bring any room to life! We've seen our Austin Light Co. bulbs used in: bars, restaurants, cafes, stores, bistros, and some outdoor applications. You've probably already enjoyed an Austin Light Co. bulb in one of our many commercial customers around the US. Socket Type: E26 / E27 base (fits A-15 & A-19 bulbs) (standard USA sockets).